More than anything William wants a doll. He wants to take the doll to the park, push it in the swing, bring it home, kiss it goodnight and wake it up again in the morning, just as if he were its father and it was his baby. William dutifully plays with the train set his father gives him. He gets quite good at shooting the basketball from his father. Still, though, he wants a doll. His brother and friends call him a creep, but what will Grandma say when she finds out? 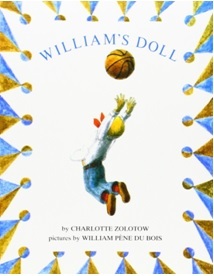 William’s Doll has been in print for forty-plus years because it does what a really good story is does best; it allows the reader to enter someone’s experience in a meaningful and touching way, without schmaltz or heavy-handed moralizing. Zolotow’s tone is warmly matter of fact, as if written in the voice of the grandmother character. The grandmother in the story is what we should all aspire to be if we are blessed with a grandparent role. She is interested, attentive, kind, and gives her grandchild the space to be who he is. Without ever sounding heavy handed or appearing to baldly push home a point, Zolotow’s story makes several very strong ones. The nurturing capacity of men and boys and the importance of fatherhood ring throughout this book. The innocent nature of children simply being who they are regardless of gender is made abundantly clear. The power of caring adults to gently and clearly speak out on a child’s behalf is evident. There has been much change in our society and our congregations in the forty some years since this book was written. Men are allowed and expected to play nurturing roles as parents and grandparents in ways they rarely were allowed when the book was written. Men and children have benefited from that greatly. And yet, we have not come so far that this book is no longer relevant. Far from it. At various developmental stages, children tend to take in and amplify gender expectations. They are trying to make sense of the rules of the world and how they fit in. This book, read in their place of worship, will help them to understand that a loving, kind, and accepting response is more important than whether someone fits into “the rules” of convention. This book will be especially powerful in helping them know they are each valuable and okay as they are, even if they are different than their peers. It is a powerful illustration of non-judgment and compassion, cornerstones of every religion.